SCS-IX V5.0.1 for SCS.4DJ now available! - Fixes "Disk Full" issue for some users when a drive is below safe storage threshold. Headphone Output: ¼ ", 1/8"
The SCS.4DJ is powered by SC-IX V5.0, the most advanced embedded operating system on the market. SC-IX provides signal processing, playlist management, onboard analysis, deck, hotcue and looping functionality, and. SC-IX also delivers visual feedback directly to the integrated display so that your focus remains on the surface. SCS.4DJ will analyze your music and calculate a “beat-grid”, this is at the heart of synchronizing tracks during a mix, or keeping loops/effects in time. Your music is shown as frequency dependent color waveforms to keep you connected to your mix. SC-IX has a large amount of customization from the System menu allowing features to be adjusted to match your style of DJing. Built on a Linux base, SC-IX is rock solid and made for reliable operation. High resolution 4.75” touch sensitive and naturally weighted zinc platters for the true turntable feel. Each deck has full transport control, and can be used in traditional scratch mode, touch start mode, tempo bend mode or to fast forward and rewind with accuracy. Each deck also has a 60mm high resolution pitch slider for super accurate control of tempo when mixing. A unique DSP key lock function keeps the pitch of the song steady regardless of any tempo changes. The mixer stage contains a full three band equalizer per channel with individual cue controls, channel activity LED’s and a long life digital cross fader. Multiple Hot cues, cross fader curves, channel gain, microphone gain and headphone gain can all be customized to match your requirements. Unique features like “time-rift” and “continuous sync” allow for exciting performance possibilities. 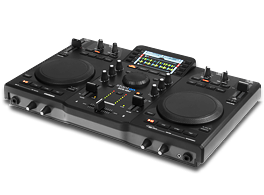 Eight DJ specific effects can be controlled using a dedicated engage switch to let you know it is active and two high resolution rotary controls which can adjust multiple parameters giving you the ability to create thousands of effects variants in real-time. The SC-IX operating system keeps all of the effects synchronized to your mix to ensure you get the best results every time effects are used in the mix. If you have a large music library (up to 50,000 tracks) you can use the free QuickGrid software to perform the track analysis on any single or multi-processor Apple Mac / Windows PC. Quick Grid will analyze your music library and prepare any USB device for use with the unit. Quickgrid can be downloaded FREE from the www.stantondj.com website. Press the Record button and SCS 4DJ will record your performance to any USB storage device. Your recording along with the playlist can be shared between friends, posted to a cloud sharing site or used to produce a remix or a live set. USB based mass storage device including flash drives, hard drives, smartphones can be used with the SCS.4DJ. Supported drive formats include FAT32, NTFS and HFS+ (non journaled), while supported audio formats include WAV, MP3, AAC and FLAC. 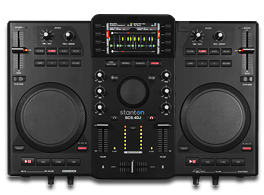 There is also a host port which will allow SCS.4DJ to be used as a MIDI controller for any MIDI compliant software application. One of the four USB ports can even be used to connect a standard USB keyboard for even faster search / browsing functions & other basic controls. Available as an accessory, this messenger style bag is specifically designed to hold The SCS.4DJ hardware as well as headphones, power supply and other accessories such as hard drives. It has rugged nylon padded panels, custom foam insert, heavy duty buckles, an ergo-grip handle, and a padded shoulder strap. Comprehensive Browse, Search and Sort capabilities presented in a simple and intuitive user interface. 8 x "Soft" Display buttons allowing direct access to features, functionality and navigation. 4 x "Direct Access" illuminated buttons allowing instant access to important screens. Full Navigation system including endless encoder and ENTER/BACK switches. Smart Synch capability for one touch beat-matched synchronization, even at half the correct tempo. Auto-DJ mode will mix your playlists automatically using the calculated beat grids. Multiple customizable user-options such as Audio, Platter, Crossfader & Display Settings. Microphone input with high-headroom and low noise performance. Transport controls featuring PLAY/PAUSE, CUE, SYNC and TAP tempo. 3 band EQ per channel, at DJ friendly crossover points with complete kills, and 6dB boost. 8 Beat synchronized Effects per channel, with two parameter knobs for custom real time control. Dual 4,560 point high-resolution 4.75" touch-sensitive naturally weighted zinc platters, with scratch, touch and fast forward/rewind functionality. Individual 45mm volume faders for each channel with DJ friendly fader caps. High-quality digitally-controlled 45mm cross fader with incredible durability and multiple fader curves to fit your style. Auto Loop – intelligently creates a beat synchronized loop from the current song position. Loop Length – multiply and divide the length of the loop. Reloop – automatically jump back to the last loop you used. Tri-Color input Level LED's showing deck volume. Large Play/Pause and Cue transport buttons. Large TAP tempo button to correct BPM. Large Sync button located with the transport controls for instant beat matching of one deck to the other. 4.3" high resolution widescreen color LCD with adjustable brightness. 8 x "Soft" buttons allowing direct access to features, functionality and navigation. 4 x "Direct Access" illuminated buttons, HOME/WAVEFORM, BROWSE, PLAYLISTS and SYSTEM. Navigation wheel with BACK and ENTER buttons for fast navigation of all screen based activity. 7-LED stereo master output meters, deck tri-color LED level indication. Record button – Record your mix directly to a mass storage device. Connect standard USB keyboard for even faster navigation, search & basic controls. 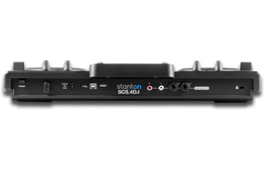 SCS.4DJ supports M3u playlists created by standard music librarian applications/devices. Recommended drive formats are: NTFS, Fat 32, HFS+(OSX) Non-Journaled. Supports most unprotected file formats including WAV, MP3 and AAC files. The tough design construction of this bag uses premier materials throughout offering the ultimate protection for the SCS.4DJ All-In-One Digital DJ System. There's a large outer pocket for your headphones, and a secure kangaroo-style pouch for your cables and manuals. 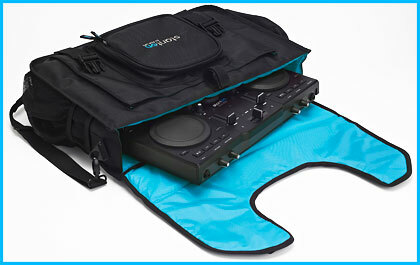 The SCS.4DJ Bag also has compartments for drives, audio interfaces and more. Padded straps and ergo grip handles make transportation of your unit painless. Stlyish messenger bag designed for transportation and protection. Rugged nylon exterior and thick padded interior. 10mm EVA foam layers sewn into multiple sides of the bag. Removable custom foam cradle with cutout specifically for SCS.4DJ for extra protection. Heavy duty buckles, ergo-grip handle, & padded shoulder strap. Bright 'Stanton Blue' interior lining for better visibility in dark clubs or rooms. 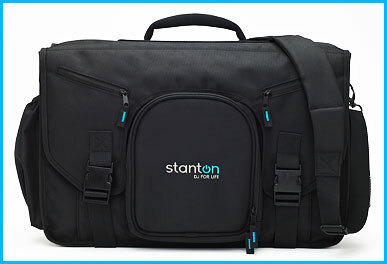 *The SCS.4DJ bag also fits the Stanton DJC.4 and many other standard 2 deck MIDI controllers. 1-Large compartment for SCS.4DJ with removable cradle. 2-side pockets (1 double mesh net-style pocket, 1-solid nylon pocket). 1-front open "kangaroo style" pouch (only revealed when the bag is unbuckled). 1-headphone compartment with zipper and inner sleeve pocket. 2-small mini pockets, perfect for small cables, USB lights and thumb drives / hard drives. Exterior Dimensions (H x W x D): 17" x 23" x 7.5" / 43.18 cm x 58.42 cm x 19.05 cm. Interior Dimensions (H x W x D): 14" x 19" x 3.5" / 35.56 cm x 48.26 cm x 8.89 cm. 3 lbs. / 1.36 kgs. Before you begin… Firmware updates will ensure your SCS.4DJ includes the latest features and improved functionality & speed. The latest update can be found under the support tab on the product page. The latest firmware at the time of writing is version 4.0. Our offline analysis tool, QuickGrid is available to download for users with large libraries or those who wish to analyze their files faster on their own computer. (Between 25 and 80% faster, based on computer speed). When using QuickGrid make sure you have adequate space (10% on OSX, 15% on Windows) on both your internal hard drive (local library) and the external drive you plan to work with. You will get an “unavailable space error” if there is not enough room on either drive. Recommended drive format types are NTFS, FAT32 and HFS+ Non-Journaled. NTFS is the most stable format, but can be slower on some drives (depending on their read write speed). If you experience stuttering (especially when recording), format in FAT32. For optimum performance, please purchase drives with a rated speed of at least 4MB/s write and 10MB/s read speed. This speed will greatly affect the audio playback and recording capabilities. Stanton recommend the use of 7200rpm speed when using a traditional (no-flash) hard drive. To create a playlist in iTunes™ WinAmp™ or other media player export an .m3u file to your USB device and copy to the folder containing music connected to your SCS.4DJ. To create a playlist using the SCS.4DJ press BROWSE, higlight selected song, and press “To Playlist”. This active playlist can be saved to your USB device at any time. The SCS.4DJ comes with a protective film over the widescreen LCD, if you screen appears scratched, cloudy or hazy please remove this film. Visibility is greatly improved without it. To hide the included demo audio files press SYSTEM and follow this path: Display Settings > Hide Demo Content. Demo content will be hidden next time you power on your SCS.4DJ. If you accidentally LOCK your unit, press the BACK and ENTER buttons together to unlock your system. Tracks only need to be analyzed once (unless they are deleted & re-added to drive or are used on a different machine). If you have trouble reading / playing a file or playlist that was previously there please “Rebuild Song Database” on the drive from the ‘Device Setting’ in the SYSTEM menu. If you plan to record using the SCS.4DJ please make sure you have ample space on the drive connected or simply connect a new/empty drive and select it to record to. Auto-DJ only works with a pre-created playlist. So make sure you have a saved playlist on your device or create one first. Load that playlist and then load the first two songs… the rest will play in order and be beat-matched if possible. If you have not had time to prepare a playlist, you may use the “ToPlaylist” soft-button within the “Browse” menu to load a few songs to the active playlist that will then be used by the Auto-DJ function. 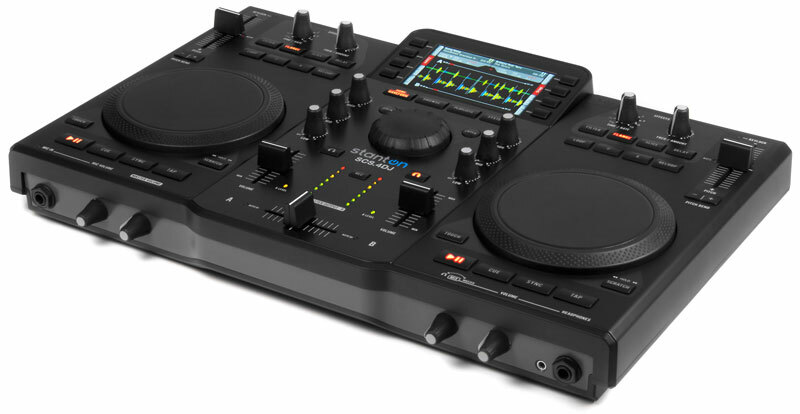 Remember Auto-DJ takes over the pitch, line & cross faders, even if you disable Auto-DJ you may still need to move these faders around to regain manual control. USB ports cannot be used to directly access music on a computers hard-drive. SCS.4DJ only interacts with a computer when you are using it in MIDI mode with a compatible software. The embedded hardware does not provide any storage for user-created files. You must connect some type of drive with available space via the many USB ports, to play music from and / or record to. When performing a system update, it is important not to touch the platters, as this can cause a very rare issue where the update may fail, causing the unit to become inoperative. If this happens, it will be necessary to repair the unit under warranty as this is not user-servicable. 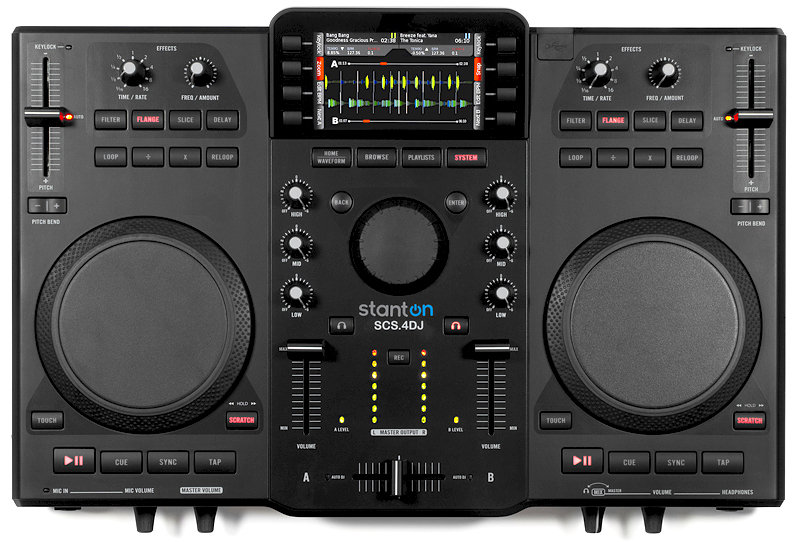 New to SCS.4DJ’s Version 3.0 software are Hot Cues. These can be used in addition to your main cue point for playing different points of the song in a rhythmic fashion (like a drum machine). Hot Cues also start playback when pressed (if a deck is paused), unlike the main Cue point which will play back until you let go of the button. A useful way to find songs is to select BROWSE then ‘sort’ (from the soft buttons near the screen), then sort by BPM. Now your entire library is arranged by BPM. There are three basic platter modes, Jog (for pitch bending), Scratch (for touch sensitive scratching and spinning) & Touch (for tapping the surface as a scratch-able cue button). To scroll (fast forward / rewind) a track, press and hold the SCRATCH button while rotating the platter forward or backward. Your default loop size can be changed within system settings. With version 3.0, your last loop is saved with your song, for recall the next time you call up a track.